Beyonce and younger sister Solange had a quick getaway over the weekend, following that now famous elevator fight with Jay Z on May 5. Shortly after the violent video between Solange and Jay Z went public, E! News confirmed through immigration reports that the two siblings flew to Costa Rica for a few days late last week on a private plane. Beyonce and Solange reportedly entered the country at 7:56 p.m on Thursday, May 8 . and left at 5:30 a.m. Saturday morning. So what was the reason for their getaway? Was Solange blowing off some steam? It seems as though they may have been in Costa Rica for Kelly Rowland's reported wedding. Kelly, Beyonce's mom, Tina Knowles, Kelly's fiance, Tim Witherspoon, and Destiny's Child bandmember Michelle Williams were also in Costa Rica during the same few days, according to local paper La Nación. The ceremony allegedly took place on Friday, May 9, and while there are no photos of the event, Beyonce posted an Instagram snapshot on Saturday of herself looking like she was wearing a bridesmaid outfit. She captioned the photo, "GoodMorning." Jay Z did not travel with Beyonce to Costa Rica — he was not included in any of the immigration reports. And that may or may not have anything to do with what went down last week inside the Standard Hotel. Elevator surveillance footage, obtained by TMZ, shows what appears to be Solange throwing punches and high-heeled kicks at her brother-in-law in a violent scuffle after the Met Gala in New York City. The Standard Hotel released the following statement: "We are shocked and disappointed that there was a clear breach of our security system and the confidentiality that we count on providing our guests. We are investigating with the utmost urgency the circumstances surrounding the situation and, as is our customary practice, will discipline and prosecute the individuals involved to our fullest capacity." What do you think? Did Kelly Rowland get married? Should Beyonce be mad at Solange? 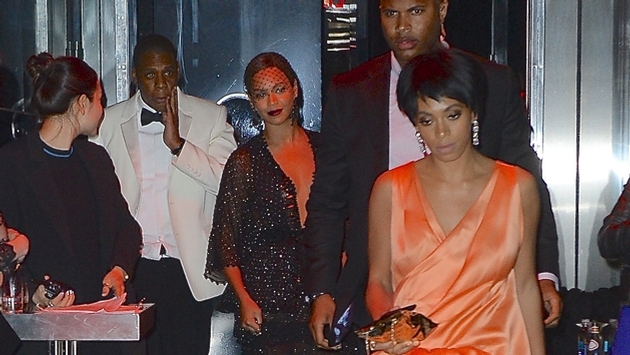 Did Jay Z skip the wedding due to Solange? Would you? Tell us how you feel in the comments section!